From left: Technical College headmaster Roland Schober, social education worker Edwin Bischoff and Wenatex Germany Managing Director Michael Wernicke. 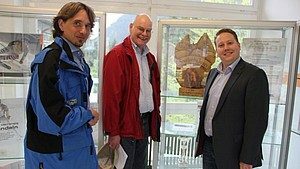 With the support of Wenatex, the CJD Christophorusschulen (schools run by the Christian Youth Village Foundation CJD) in Berchtesgaden, Austria, sponsors technical college students from families that are not so well-off by offering annual scholarships and pays the annual fees for up to three students. The business from Salzburg donates 4.500 Euros. Students at the technical college of the CJD Christophorusschulen Berchtesgaden are able to acquire their advanced technical college entrance qualification after two years. This qualifies graduates to study in all advanced technical colleges in Germany, as well as in many of the colleges in Austria. “We are delighted to be able to support the students in this way, and we are most grateful for the scholarship funding from the business sector.” explains Magister Roland Schober, head of the technical college.Michael Wernicke, Managing Director of Wenatex Germany was once a student of the secondary school of the CJD Christophorusschulen Berchtesgaden and lived in the CJD residential school Am Dürreck. But that is not the only reason that he is concerned with the support of the students there. He is also convinced that business within the region will ultimately profit from this expanded training offer. Wenatex has its headquarters in Salzburg and further branches in Austria, Germany, Italy, Switzerland and Australia. The enterprise has been committed to supporting a number of social projects over the years.